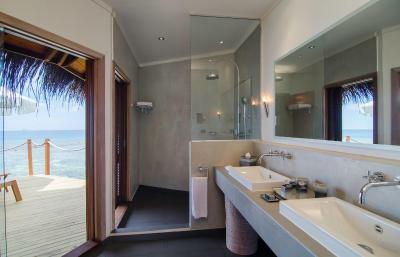 Lock in a great price for Mirihi Island Resort – rated 9.6 by recent guests! The buffet is much beyond our expectation, everything is tasty, definitely the highlight of our holidays. The service is warm and well considered. 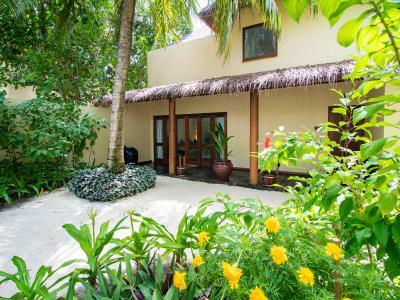 Great location with privacy, suitable for who wants to have quiet and relaxing holidays.You can meet small tiny sharks during the snorkeling or even walking on the beach. The arrival by seaplane ! The island itself is a tiny and beautiful one. The layout of the common parts (restaurant, bars) is really charming. We loved the « everywhere barefoot » concept The silence : one hears only the ocean waves. The staff service is absolutely outstanding : they pay attention to every detail to make your stay a perfect one, and they manage to be present without being too present. The hypnotic atmosphere late afternoon at the sunset bar, with delightful light and breeze. Really nice boat trip, the « whale shark seeker » one, and great encounter with the whale shark ! Above all, the food is absolutely fantastic ! It would be fantastic if in Switzerland or France, but it’s even more fantastic considering all of this is prepared in the middle of nowhere ! Big congrats to Mr FELIX ! The food was first class. It pristine resort which is perfectly Maldives! Luxury, beauty, elegance personified. Amazing place to be, all staff very smiling and professional, personalized service, excellent quality of food, diving and snorkeling incredible! 3rd time in Mirihi and probably not the last! !Thank you to everybody! First class service in a relaxed atmosphere. Mirihi is paradise. We enjoyed 4 fantastic days with beautiful beaches, gourmet food, and amazing activities including swimming with Manta rays and whale sharks. Every member of the staff were outstanding and helped make this a special place, especially the evening performance by Mohammed. 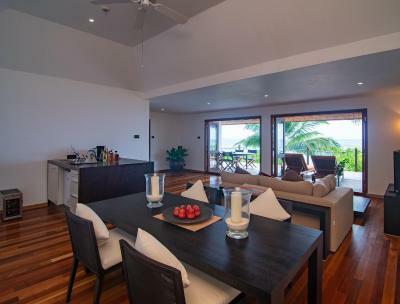 Mirihi Island Resort This rating is a reflection of how the property compares to the industry standard when it comes to price, facilities and services available. It's based on a self-evaluation by the property. Use this rating to help choose your stay! 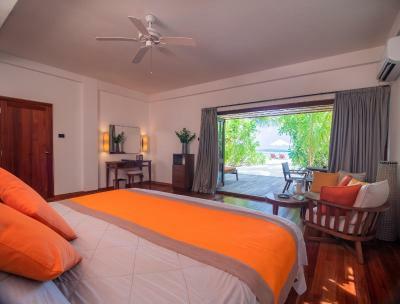 Named after a local flower, the tropical Mirihi Island Resort offers beachfront or water villas with free WiFi in the rooms and the property in Maldives' South Ari Atoll. 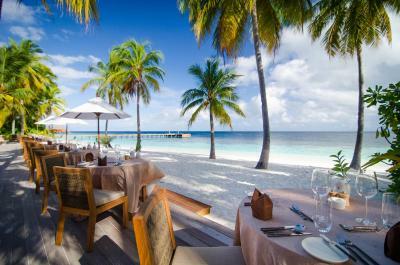 It features 3 dining options and clear waters with beautiful coral reefs. 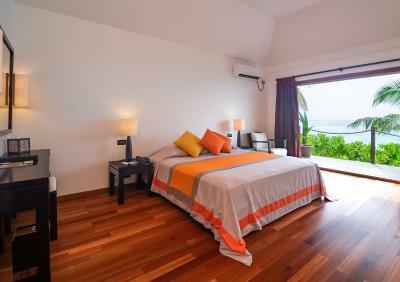 Rooms at Mirihi Resort feature polished wooden flooring and spacious outdoor seating. Overlooking the beach or sea, each is equipped with a CD player, tea/coffee making facilities and sun loungers. Toothbrush and slippers are available on request. 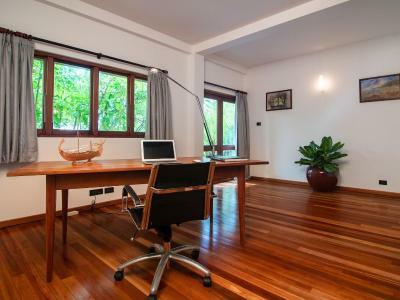 This property is also rated for the best value in Mandhoo! Guests are getting more for their money when compared to other properties in this city. When would you like to stay at Mirihi Island Resort? 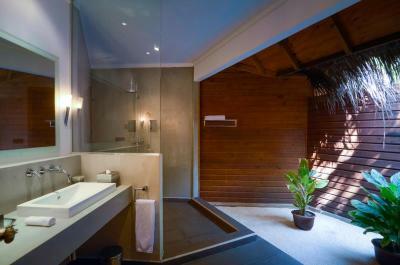 Over-water villas offer direct access to the ocean and an outdoor freshwater shower. Kindly note that the minimum age for children is 8 years old. 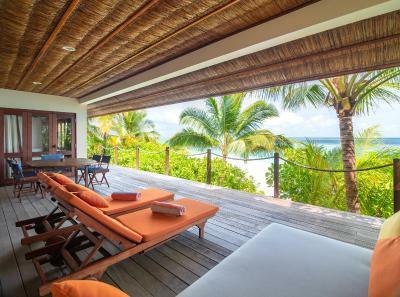 Villas offer direct access to the beach. 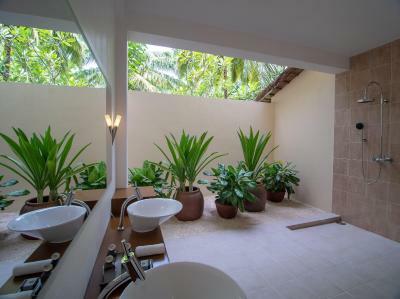 House Rules Mirihi Island Resort takes special requests – add in the next step! All children under 12 years are charged USD 246.40 per night for extra beds. Any additional older children or adults are charged USD 246.40 per night for extra beds. Mirihi Island Resort accepts these cards and reserves the right to temporarily hold an amount prior to arrival. to arrival. Please get in touch with the property for details on baggage restrictions. payment at the hotel. Please note that property may contact the cardholder for verification purposes. guests including model aircraft by recreational users and hobbyists is prohibited. It is pricey but you get what you pay for. It is a remote place after all and the produce was incredible as well as the care and attention received from staff. The only low point was the Whale Shark tour. Not the fact we didn't saw any (that's not Mirihi fault), but i suggest that next time that is not possible to see any whale shark we could get to snorkel close to the área where they are suppose to appear and not far away as it happenned to us, because we snorkelled for 3 or 4 minutes and we were rushed into the boat to se something that wasn't already there. So, next time, just put everyone snorkeling on that 5 or 6 km área and it would be easier to MAYBE see after some whale shark. 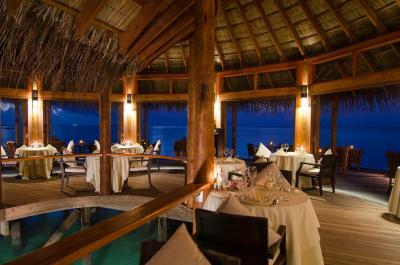 Mirihi Island Resort is just the Paradise. It was our 2nd time in Maldives (1st time was 10 years ago, but this was our 1st time in Mirihi), and we were delighted with Mirihi Island Resort. Everything was just perfect. From the staff (before we started our honeymoon), the staff there and the fact they are always attention to us and care about you without being annoying, to the location, to the Beautiful water villas, to the cleaning, the beaches, the FANTASTIC food, the house reef, everything was just PERFECT! I have to highlight the specail attention from Muhammad, Mohammed Ali, Raouf, Fernando, the omolet men at the breakfast (sorry i forgot your name), pur buttle on the dinner beach, Urs, Patrick and all the others that gave us all the attention. I requested for our honeymoon several details and surprises to my wife and it couldn't be better, from the dinner at the beach, to the beds outside the villa over the water and underneath the stars...all was the best we could get!! Many thanks to you all!! The space in the room, though not very spacious, but enough. There are free and easy to access water activities. Great food and great staff. No insects at all. Everything. I love everything about Mirihi Island Resort. The food was delicious, our water billa was divine and the staff were amazing. It was paradise. I love everything about the property. The exclusivity, the fact that there weren’t so many people and the beautiful staff most of all. Scuba diving at the dive shop is a more than expected expensive proposition, although the staff at the dive shop were excellent. Very attentive and responsive staff. Excellent food!!! !